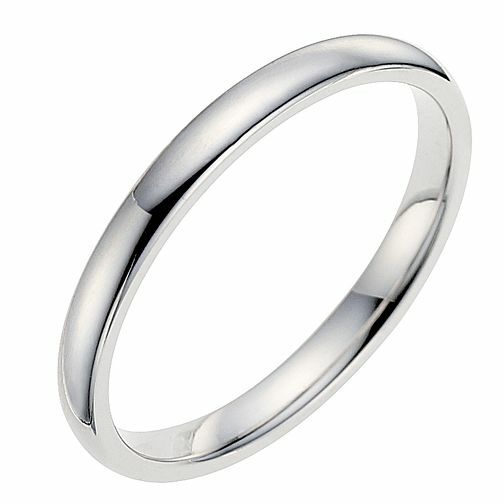 18ct white gold polished D shaped wedding band. A classic choice. 18ct white gold 2mm extra heavyweight D Shape ring is rated 5.0 out of 5 by 2. Rated 5 out of 5 by Anonymous from Lovely Got this to go with an eternity ring purchased the week before. It was just a shame when I got the diamond ring they didn’t suggest I could use the gift voucher they gave me to buy the matching band. It would have saved me ordering it then having to exchange it for a different size etc. Rated 5 out of 5 by Anonymous from Wedding ring replacement Purchased as a replacement wedding ring it’s a lovely fit and sits perfectly with my engagement ring.